We have all heard about the gender wage gap, a serious issue that affects us all, mainly Latina and African-American women. But there is something that we can do- negotiate. Join us to learn how to best advocate for yourself in the workplace, with a negotiations strategies workshop led by Prof. Jessica Notini. Prof. Notini is a Lecturer at Stanford Law School and Adjunct Professor at Mills College, UC Berkeley Law School, and UC Hastings School of Law. 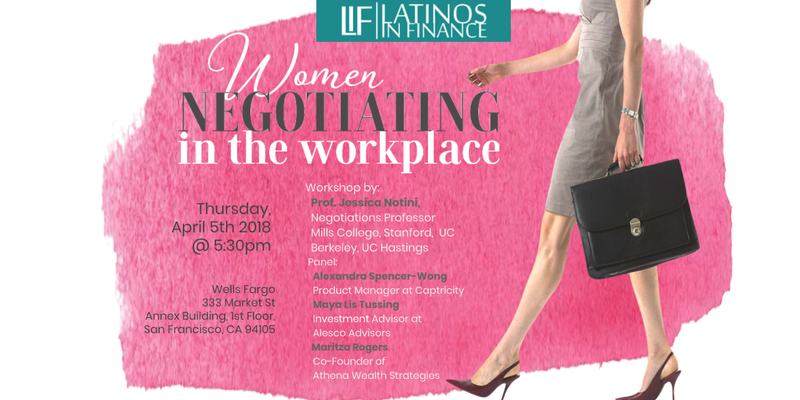 The workshop will be followed by a panel of powerful female professionals, whom have broad experience with negotiations- Alexandra Spencer-Wong, Maya Tussing, and Maritza Rogers. Alexandra Spencer-Wong is a Product Manager at Captricity; Maya Tussing is a Chief Investment Officer at Alesco Advisors LLC; and Maritza Rogers is the Co-Founder of Athena Wealth Strategies. The attendees will leave empowered with effective negotiations skills in their backpocket and the confidence to speak up for themselves and their counterparts.